The previously exported files will be imported. Duplicates will not be imported. Just follow instructions after clicking Import. It is highly recommended that you save your data on a regular basis! By selecting this button the system will ask you to enter a new name for the (predefined) field "Other Time". This will automatically change all related fields in the respective reports and in the "Totals" frame. generate a printable list of all airports, including lat. and long. Personalize your Electronic Pilot Logbook bei entering your name, certificates and ratings. Opens Help. Acrobat Reader required (free download link provided in the application). Enter the record number you wish to display, then press enter. The current record number is displayed in the upper right corner. First, Previous, Next, Last (record). Enter the departure date manually or click onto the calender symbol. Select the appropriate category by clicking onto the small dropdown arrow. If you don't, some Reports will not work! Unessessary fields will be disabled after you have selected the aircraft category for this flight. Enter Aircraft Make and Model. Enter Aircraft Registration Number (ID). Over 7000 Airports are already stored. Enter the Airport Identifier or select one from the dropdown list. Airport Identifiers should be entered in their ICAO format, for example airports in the continental US begin with the letter "K" (LAS for Las Vegas is KLAS). This helps to avoid confusion when you fly in other countries as well. Click "i" for further information. Information on how to enter Airport Identifiers. Aircraft Single Engine Land time. Aircraft Multi Engine Land time. Aircraft Single Engine Sea time. Aircraft Multi Engine Sea time. Aircraft Single Engine Land or Sea (Amphibian) time. Aircraft Multi Engine Land or Sea (Amphibian) time. Multi Engine Inline Thrust time. Aircraft over 12,500 lbs time. Complex time (f.e. constant speed prop, Retractable gear). Flight conducted between Sunrise (1 hr. before) and Sunset (1 hr. after) time. Flight conducted between Sunset (1 hr. after) and Sunrise (1 hr. before) time. Flights of 50 nautical miles or more between "From" and "To". If the distance between your "From" and "To" is below 50nm, a small note below the field will inform you accordingly. Time as Pilot in Command or Second in Command. Make sure you have checked the PIC (standard) or SIC checkbox before you enter your time. If you have entered time under PIC and then click on SIC, PIC time will be deleted for this flight. Time acting as Flight Instructor. Total time should be Day + Night + Sim time. If your entered times don't add up to the total time, a message below the total time field will appear. If entered times are correct, then the message will read "Checksum info: OK!" Number of Takeoffs Day Land. Number of Takeoffs Night Land. Number of Takeoffs Day Water. A good way to kill yourself. Number of Landings Day Land. Number of Landings Night Land. Number of Landings Day Water. Wouldn't recommend it. Another good way to kill yourself. Duration of flight in IMC (Instrument Meterological Conditions, i.e. "in the soup"). Duration of flight under the Hood (Training). Navigation on Federal Airways (for example "Victor" Airways). Check this box (required by the FAA for Instrument Currency) if your flight was conducted accordingly. Holding patterns during this flight. By selecting this button a drop-down list will open. All you need to do is to choose the desired approach type(s). The list includes ILS, VOR, NDB, MLS, GPS, LOC, VIS approaches (and combinations thereof). The list's purpose is to reduce your work load (for example if during one flight you have been practicing multiple approaches with different approach types, such as ILS and VOR), but of course you can specify your own approach type(s). General: Enter general information such as "Best flight ever!" or "VFR SEL Checkride passed, Examiner John Doe". 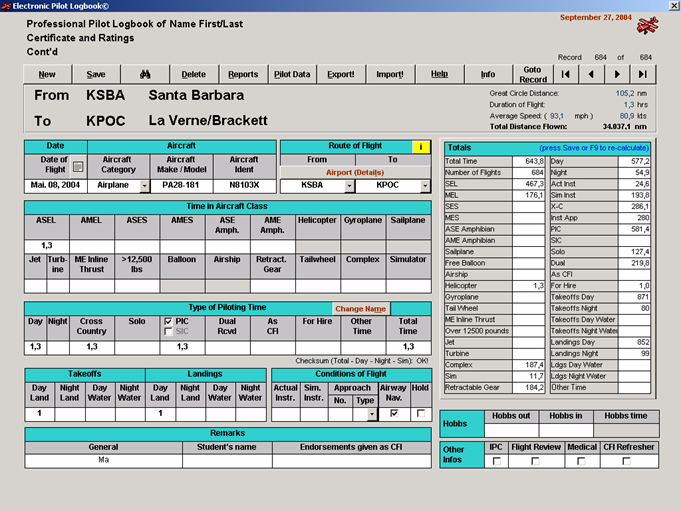 Student's name: Enter student's name if acting as CFI - useful, if you wish to print a logbook report for the student (see "Reports") or the FAA..
Endorsements given as CFI: Some CFIs like to track their given endorsements..
By selecting this button you can export your complete Electronic Pilot Logbook. Just follow instructions after clicking Export. By clicking this button the system will -before actually deleting the current entry- ask you to confirm your command (so the possibility of accidentially deleting an entry is minimized). Enter your search string, press "Search" and the system will search the complete logbook (all fields) matching your query. If more than one matching entry is found, then the first matching entry will be displayed. By clicking "Continue Search" it will go to the next ..and so on. Save all data, including new entries. After the data is stored, the last entry will be displayed. Automatic display of your totals. When entered a new flight, press F9 on your keyboard to actualize (if not saved previously). Note that the field Other Time will automatically be re-named when changing the field name using the button "Change Name". The Great Circle Distance will automatically be calculated, if you have previously entered the geographical data for the respective airports (to do that click on "Airport Details"). More than 7,000 airports from all over the world are already in the database, including geographical data. The total flown nautical mileage is displayed as well. In addition, the complete name of the airport will be displayed in "plain language". Furthermore your average speed for this flight between your From and To will be displayed. If your rental or owned aircraft is equipped with a Hobbs-meter, then you should enter the Hobbs out and Hobbs in times into the respective fields. Total Hobbs time will be calculated. By clicking this button a blank entry form will open, ready for your input.